Austin Peay continued its home stretch at Raymond C. Hand Park on Tuesday, March 12 to take on the Indiana State Sycamores in a make-up game from last month. This one needed a total of 11 innings, but in the end, the Govs pulled out a 6-5 win over a team they met in the Oregon NCAA Regional last season. On the mound for the Govs was Ryan Quick, making his first start of the season against a Indiana State team who came in with a record of 5-5. After a scoreless first inning, starting Sycamore pitcher Tyler Fehringer walked two batters in the second to set up Reed Harper to bring home Craig Massoni from second base. Designated hitter Kyle Schlatter then pushed across another run with a single to shallow right field to score Cody Hudson, making the score 2-0 Govs. Indiana State got on the board in the fourth with a two RBI single by Jeff Zahn, then after a pitching change by the Govs, the Sycamores tacked on another run off Kacy Kemmer, a sacrifice fly by Landon Curry to give the visitors the lead 3-2. After infield hits by Dylan Riner and Kevin Corey, and Tommy Hager reaching on a fielding error, Jordan Hankins tied the game at three with a sacrifice fly to bring home Riner. In the fifth, Indiana State continued to answer back with the bats, and after a bunt single by Jacob Hayes to score Casey McCurdy, allowed the Sycamores to regain the lead. But in the bottom half of the inning, Schlatter picked up his second RBI of the day for the Govs with a double to center field to score Harper from first base, tying the score at four runs a piece. Both teams failed to score in the sixth, but in the following inning, the Sycamores scored off a wild pitch from Austin Peay relief pitcher Don Whitson Jr. to make it 5-4. The pitching stepped up in the eighth for both sides with Casey Delgado coming in for the Govs and only allowing one hit while Indiana State summoned closer Josh Dove from the bullpen, getting an inning-ending double play to send the game to the ninth. Alex Belew came on for the Govs, making his first appearance of the season, to pitch a scoreless ninth, giving Austin Peay a chance to come back with three outs remaining. 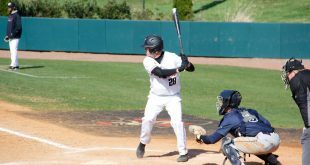 Hudson, who was named the Player of the Week by both the National Collegiate Baseball Writers Association and Tennessee Sports Writers Association, delivered in the clutch once again for the Govs with a lead off double in the ninth. Harper then scored Hudson with a RBI single, tying the game and forcing extra innings. Belew remained on the mound in the tenth, getting out of the inning with a fly out and two strikeouts, to give the Govs offense another opportunity to win the game. However, Massoni grounded into a double play to force another inning needed to settle this one. APSU went with closer Tyler Rogers in the eleventh, allowing no hits to send the game into the bottom of the inning. After a fielding error and throwing error by Indiana State, Hudson found himself on third base with no outs. The Sycamores intentionally walked the next two batters to set up a force out at home plate, and after a strikeout by Schlatter, brought up the center fielder Riner. Riner lifted a deep fly to center field, allowing Hudson to tag from third and score to end the game. The Govs improve to 14-2 on the season and end their home stretch going 11-1. 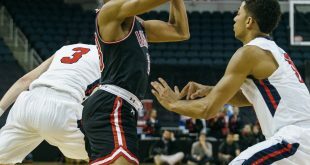 Austin Peay will be on the road for the next five games as they start their road trip Wednesday against Lipscomb before opening conference play against Eastern Illinois this Friday, March 15.